Take Francis Lewis Blvd North. 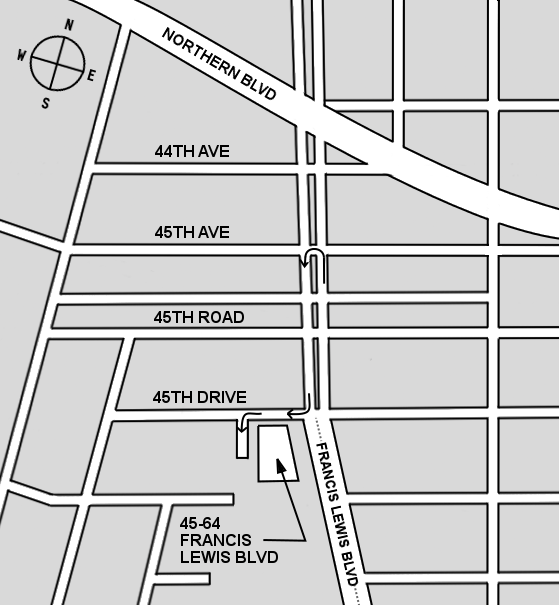 Pass the Center on your left, make a U-turn at 45th Ave, and turn right on 45th Drive. Take the first driveway on the left and go down the ramp to park in the basement garage. Take the elevator to the second floor. Go south on Francis Lewis Blvd. Turn right onto 45th Drive. Take the first driveway on the left and go down the ramp to park in the basement garage. Take the elevator to the second floor. Continue on FDR Drive. Take I-278 W, Grand Central Pkwy and I-495 E to Horace Harding Expy in Queens. Follow Jackie Robinson Pkwy, Grand Central Pkwy and I-295 N/Clearview Expy to Clearview Expressway Service Road in Queens.